Only one one millionth of one percent of the total world population compete in the Olympic games. So it goes without saying that getting to that level of competition is an absolutely incredible feat. It takes an immense amount of dedication to the sport, mental stamina and overall health to even be considered for such a position. Trust us, training sessions are no joke. If anyone can attest to that, it's Ali Krieger. The US soccer player who will be vying for an Olympic gold medal during this year's Rio games has put everything she possibly can into her training. After suffering a substantial knee injury right before the 2012 Olympics, Krieger had to completely recover and restart trainings before she was able to hit the field running. With a lot of tenacity, she was able to return to her position as a defender on the US women's national soccer team and will soon be competing at the highest level at this year's Rio games. We recently sat down with the athlete to talk about her road to recovery, what training sessions are really like leading up to the Olympics and more! #YouShouldKnow is a feature that showcases rising talents. 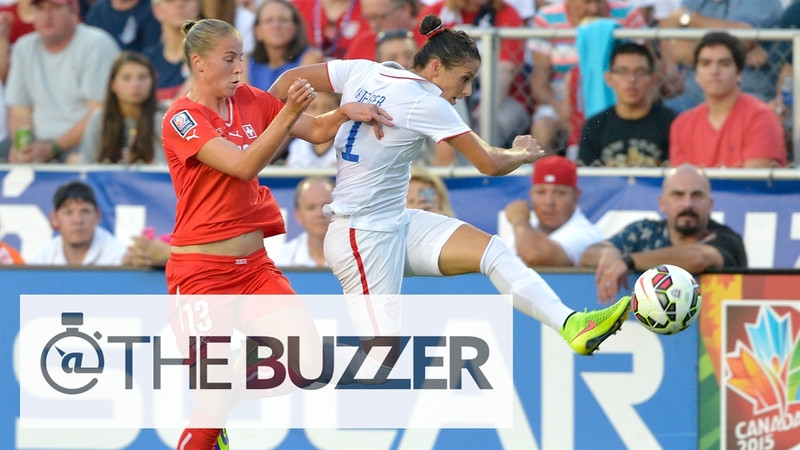 To see more past interviews, including more Ali Krieger exclusives, click here. What was your road to recovery like after your injury in 2012? Like I said, it wasn't an easy a road. I've had three major injuries throughout my career but I never lost my love of the game. I think that watching the Olympics from the sidelines was an exciting moment, but it was a different type of feeling because I wasn't physically there to help the team but I was vocally there to help the team. So I had to play a different role and felt like I was a part of the team the entire year because of how much we kept in touch and continued to motivate each other. The girls were so great motivating me throughout my rehab and it was a tough experience, but I was so happy because I felt part of that win since I was there and celebrated with the whole team. The girls were sharing their gold medals with me and putting it around my neck, so it was a really great experience and I was so proud to be a part of that. I felt like I was still there and that motivated me to get back onto the field now. I think we all see the level of camaraderie you have with your teammates on television, but can you talk to us a little bit about the dynamic between you and the rest of the women on the team? We have a certain level of respect for each other and I think if you don't have that your team could possibly fall apart. And we have that and we really care about each other. I think that off the field, we're not all best friends but we all have that mentality and vision of success and what it takes. The determination, motivation, and competitiveness that we have that drives us to want to be so successful is the same mentality we've had over the years that's continually instilled into younger players of our team. We hope to carry that for years to come. That's something that's been a cornerstone for success. We have that ultimate level of respect for each other and we never get complacent. What was your training like preparing for the Olympic games? I train every single day -- sometimes twice a day -- and I give my body some rest once a day. It's tough because you go through a year of having a pre-season, having somewhat of a plateau, but you're constantly moving up. You never want to do too much towards the tournament so you have to plan out your training schedule throughout the year to lead up to the tournament properly. Now, you get proper rest before we just hit the tournament head on. We've had a few days rest after the camp we just did and we'll have one training a day instead of two. For more on the Olympics, scroll through the gallery below!